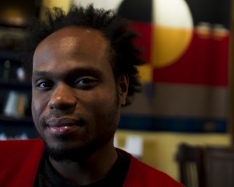 Jamaal May is a poet, editor, and educator from Detroit, MI where he taught poetry in public schools and worked as a freelance audio engineer and touring performer. His first collection of poems, Hum (Alice James Books, 2013), won the Beatrice Hawley Award. Winner of the 2013 Indiana Review Poetry Prize, his work also appears in journals such as Poetry, Ploughshares, the Believer, New England Review, and Kenyon Review. Jamaal has earned an MFA from Warren Wilson College as well as fellowships from Cave Canem and the Stadler Center for Poetry. He is founding editor, graphic designer, and filmmaker for the Organic Weapon Arts Chapbook and Video Series and teaches in the Vermont College of Fine Arts MFA program.